Wells Fargo Customers Leave in Droves? Voting with Your Feet – Wells Fargo Customers Leave in Droves? Wells Fargo just won’t die. Billions of dollars in fines and penalties. Countless lawsuits. Even probation from bank regulators. Yet the company not only hangs on, it is still earning a profit too. For many big banks, fines and penalties are a cost of doing business. Their business plan involves getting away with bad behavior for as long as they can. Only when they are finally are caught, do they pay a fine, apologize and promise not to do it again. As long as the fines are less than the profits made from gouging customers, there is no incentive to stop. Things may be changing, however. The thing every bank needs is money. Banks can leverage deposit money many times over. A $10,000 deposit doesn’t mean the bank can turn around and only loan someone else $10,000. It means they can leverage that money and loan hundreds of thousands of dollars. Last week a New York City consulting firm said that up to 30% of Wells Fargo’s customers may leave the scandal ridden bank and take with them $93 billion in deposits. And the customers most likely to leave? Millennials. Although they have less money on deposit, no bank can easily afford to lose an entire generation of customers. Why are they leaving? According to the consulting firm cg42, the number one reason is that they believe the bank was engaged "dishonest, unethical or illegal practices." Others are ready to quit because the bank tries to sell them products they don’t need. Since the fake account scandal blew up in the media, deposits at Wells Fargo are already down 2% after a puzzling initial increase. Will mere words fix problems? Probably not. The promises of Wells Fargo ring hollow. If for no other reason than we have heard them too many times. Like the little boy who cries wolf one too many times, no one really believes CEO Tim Sloan when he says his top priority is regaining the trust of the bank’s customers. Bank customers can and should leave if they are not happy. For retail customers, it is actually quite easy to switch banks. There are many customers, however, that can’t have leave. Customers that have no ability to switch. These are borrowers whose loans are serviced by Wells Fargo have a much bigger problem. They can’t switch. They are stuck. As much as we despise Well Fargo, there are worse companies. Loan servicers such as CWCapital and LNR Partners. Not only are these companies more aggressive, they aren’t regulated either. The most effective market regulator for banks may not government agencies. If 30% of Wells Fargo’s customers pack up and walk, banks will certainly wake up and listen. A massive loss of customers gets Wall Street’s attention. For borrowers who can’t leave, however, there are lender liability lawyers like us. The thin line of defense that keeps banks in line and playing by the rules. If you can’t leave your bank or loan servicer and need help in evening up the playing field, call us. We fight big banks and special servicers every day. 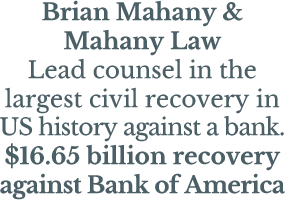 For more information, contact attorney Brian Mahany at [hidden email] or by phone at 414-704-6731. We do not handle consumer or residential cases. Because we are so busy, we do have a minimum potential loss amount of $5 million to be considered. Please visit our Cases We Handle page for a full list of cases we consider. Time permitting, we also handle CMBS workouts and modifications.